I selected a low end system with the premise of keeping the total cost of the system to just a few hundred dollars. I ended up with a four light / controller package that was under $300. For this, I acquired four 86-led light heads, small floor stands, and the controller. The controller and the light heads all use the DMX-512 control standard for lighting. This standard uses 3-pin microphone cable with XLR jacks at either end to pass the digital control signals from the controller to all the light heads. There is another DMX standard that uses 5-pin cable, but I wanted to stay with something that used the mic cables I already had on hand. This saves cost and is convenient on location when one cable can be used for either microphones or lighting, as opposed to having to bring two different sets of cable. The small metal light heads I chose are one of dozens and dozens of DMX-controllable light fixtures available. I wanted something small so I could fit several into a single Pelican case, along with the controller and mic cable. I also wanted many small LEDs in each head as opposed to some of the newer fixtures that use fewer, but more powerful LEDs. If I need to try to control the light, I wanted any edge to be “softer” as opposed to seeing two big red shadows on the wall. These also ended up being the cheapest lights. In the future I can add to my system some specialty lights, like a long bar of LED lights which would work well for a hair light/backlight, as opposed to a single small light head. I can add “white only” light heads for specific uses. I can add larger panels and uses several of them to equate a “softbox” effect. It’s like using lego pieces for lights- you can build what you want. The light heads have a row of DIP switches to set the lights to different features by themselves, with no external control. So if you needed a simple green wash for a cyc, you could do that with no external controller and then just put all the LED heads on one AC circuit you enable with one light switch. There are two XLR jacks on each head, one for DMX in, and a second to daisy-chain the DMX on to the next head. These light heads also have an AC outlet on them to daisy chain power. If the power cords were longer than just a couple feet, this would be more useful. Lastly, there’s a fuse. The small DMX controller that sets up each light, controls each color intensity, and saves scenes to be recalled with the push of a button. Initial setup is pretty simple, you adjust the DIP switches to either tell the light what to do directly, or to set it up for DMX control. When setting it up for DMX, you then also assign each head a number, so you can “talk” directly to that light head from the controller. On the controller I have, I can talk to up to 12 different lights. But there’s really even more flexibility than that. You can set any amount of light heads to the same number so you can control 4 heads as if they were one. So you are by no means limited to 12 when you can “gang” multiple light heads together and control them as if they were one head. Make your settings, turn on the DMX controller and start your programming. My light heads use 7 channels for control. 1-green, 2- red, 3-blue, 4,5,6 I didn’t use, and 7-master dimmer of all colors. I entered program mode on the controller, set up my scene, and saved it. LED Lighting for set, hairlight, and edge light. There are more complex heads that use up more channels. For instance, an “intelligent” light head that will need the same basic 7 channels I use, but then also add rotation, elevation, focus, internal gobos, rotation of the internal effects, and more. Using a circle or star pattern, out of focus, with a very slow rotation would be a great way to get a soft, mottled background that actually moves or undulates the whole time. There are eight scene push buttons across the top of my board. Then there are two “pages” per “bank” and then there are 30 banks. Even thought this is one of the smallest boards made, I could save 480 different scenes. This is useful for a stage show or a concert, but way more than I need for some talking heads. I was hired to record three days of client testimonials at my client’s annual “innovation” summit. There they invite their best customers to hear the latest innovations in management and new concepts by leading developers. These clients were going to speak on camera and tell us, as well as future customers, how great my client is. These videos are destined for my client’s web site. So the videos needed to be polished, and they also needed to have some difference to them, despite the fact that we would be shooting them all in one room, with one backdrop. 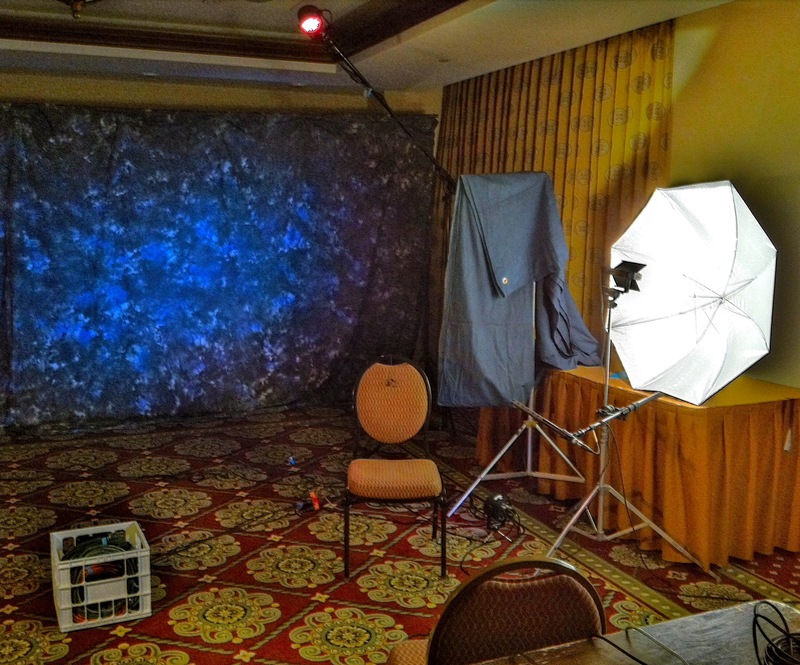 I could do it by bringing a lot of light control- gobos, gels, etc., but I decided instead to use LED lights to “mix up” the look of these interviews. I set up two LED lights on the floor, aimed at the backdrop. One was set up overhead as a hair light, and then I added one light on the floor on the other side aiming up as a sidelight. I could control these individually, but I ended up just pairing them up- two floor lights, two back lights. Pairing them up made it easy to ensure that whatever settings I gave one light would be identical on the other. I wouldn’t have to try to match them by eye. My three LED “cans” on the floor. Two next to the chair are aimed at the backdrop. The one in the foreground provides an edge light on the talent in the chair. I set some different scenes with different colors on the backdrop, and different backlights. As we set up, my client remarked that she didn’t like the green in the backdrop. No problem. The LED leads have red, green, and blue LEDs in them. Each is a very narrow band of light. If I use no green on the backdrop, the green color has nothing to reflect. It simply looks black. Conversely, there was no red and very little white in the backdrop. This made it hard to have the red LED’s have much effect. So I was not as able to affect the color of the backdrop as much as I wanted, but I was still able to take out the green & make the client happy. For the hair light, we used a light “blush” pink, soft yellow, white… and stayed away from green, which looked aweful on hair, and away from blue, which made the client blend into the backdrop. If anything, the challenge for me was to try and get a nice “wrap” of the hair light. With only one small fixture overhead, it was fairly limited in where it hit. That’s why I added the second light on the floor- to add more on the hair / back of the head, and also add a bit of edge light on the right side of the person’s face. Fully lit interviewee. White backlight, and edge light on the right side of his face, blue light on the mottled backdrop. Soft tungsten key from his left, and warmer tungsten fill from his right. The LED heads are small, light, and cool to the touch, so it was no problem to move them around and redirect them as needed. The beam angle is about 40-degrees, and it is not adjustable. You can diffuse it with some gel in front, but these lights do not have slots to hold scrims, gels, or doors to clip a gel to. However, since they run very cool, it’s easy to just tape what I need directly to the fixture. If you plan on using these lights on light stands, they come with a yoke, but typically only have options for a floor stand or a clamp to hang on small-diameter pipe. You can find any number of light stand to yoke adapters at various online shops. This simple adapter from Avenger puts the yoke light on any light stand. In the end, I was very happy with the LED lights. They did what I wanted them to do. They worked as I wanted them to work. They provided a “value added” service for me to offer the client and they solved a specific client problem. That made the client happy and that’s a good thing. My controller will handle more lights than just these four, so I plan on adding more and different fixtures to my arsenal over time. I found them to be an affordable and worthwhile investment for the future. This article was originally published October 3, 2012 at Streaming Media Producer, for whom I am a paid Contributing Editor. They have 90 day exclusivity to my articles, then I am free to republish them. There was no compensation or consideration by anyone else for this review. I purchased these lights for my own use and report on them from my own field experience. The opinions here are mine alone.